U.S. Sugar is the country’s largest, vertically integrated producer of sugar cane and refined cane sugar. Dependent on weather, growing conditions, and federal market allocations, U.S. Sugar produces 700,000 tons of cane sugar a year, providing nearly 10% of the sugar produced in America. With its headquarters in Clewiston, Florida, the company farms over 150,000 acres of sugar cane which represents about 75% of their total cane supply. The remaining 25% is supplied by approximately 45 independent farmers. The Agriculture Division manages cane production on company owned and leased lands through five Key Focus Areas including Foundation, Production/Operations, Research and Development, Reliability Excellence, and Financial performance. Production/Operations processes primarily consist of Planting, Growing, and Harvesting. Fields are planted every three to four years in the August to December time period and harvested, 24 hours a day, in the October to April time period. Over two thousand pieces of equipment are utilized, including tractors, farm implements, harvesters, cane haul wagons, loading stations, vehicles, pumps, power units, etc. Early in 2007, the Agriculture Division identified Reliability Excellence as a strategic improvement initiative and partnered with Life Cycle Engineering. A Site Assessment for the Agriculture Division was completed in March, 2007, and provided the roadmap needed for their journey of improvement with Reliability Excellence. There were no meaningful metrics in place by which to measure production availability, throughput, or production losses (OEE), nor were there any metrics in place to determine scheduling efficiency or compliance or Preventive Maintenance compliance. Maintenance work process was limited to some PM’s and emergency work. Operator Care for harvesters and farm production equipment was minimal. Major asset groups, such as irrigation pumps and product elevators, were in a regressive state with no formal plan for asset restoration. The technical skills of the Maintenance Crafts were at a fundamental level or less. There was a need for development of a comprehensive Skills Enhancement Strategy, beginning with an assessment of current skill levels of all maintenance personnel. The division was in an extremely reactive environment with no Work Management Strategy or processes being followed. There were no maintenance planners in place. There was no Reliability Engineer position in place, and no reliability strategy to support asset criticality, Failure Modes and Effects Analysis (FMEA), structured Root Cause Analysis (RCA), reliability data management (OEE), Preventive/Predictive Maintenance strategy, or PM/PdM optimization. The site was preparing to convert from an existing CMMS to SAP, and maintenance personnel had no knowledge or understanding of the requirements or scope of work expected of them during the conversion. 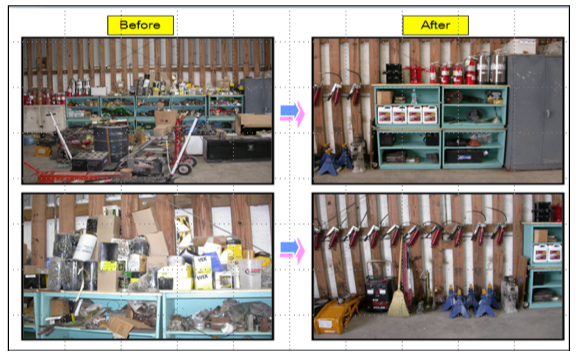 Maintenance materials were stored in a central warehouse and in many remote locations, but there were no documented processes in place to control the procurement, delivery, stocking, or kitting of parts to support the maintenance organization. Sugarcane Operations had recently experienced a reorganization that resulted in the maintenance operation being decentralized and merged into operations, with each farm having a Maintenance Manager and maintenance crews. With this decentralization came a significant reduction of central shop services and the need for central shops. The central shops that remained were to be used for mechanical harvester rebuilds and other major equipment modifications. Mechanical harvester maintenance in the field was managed out of the central shop facility during the harvest season and harvester rebuilds were managed in the central shops during the off season. The LCE project team and the U.S. Sugar Leadership Team developed a Master Plan and Timeline for Success (pictured below) to provide structure and tools necessary to ensure success of the Reliability Excellence implementation. The initial strategic decision by U.S. Sugar leadership was that both the Agriculture and Manufacturing divisions would jointly develop and implement Reliability Excellence processes. In addition to the U.S. Sugar Reliability Excellence Leadership Team, cross-functional Focus Teams were created to focus in the areas of Work Control/Planning, Materials Management, Reliability, and Operational Excellence. These teams initially developed “current” processes describing how the site accomplished all the necessary functions to maintain and repair site assets in support of ongoing operations. Focus Teams were trained by their LCE coaching team in current best practices in each area of focus. The teams then developed “to be” processes to provide structure and process to support improved methods in accomplishing the maintenance and repair of assets. Implementation of Global Processes for all work streams continues and they are demonstrating significant improvement as these processes mature. Performance metrics have been defined for all areas and are being used by the Agriculture Division Leadership Team to manage the program. While there is still much work that lies ahead along the journey to Reliability Excellence, the Agriculture Division has created the foundation necessary to achieve benchmark level performance. There have been a number of early accomplishments and successes and feedback from front line Supervision and Management has been very positive. Key Performance Indicators validate the improvements experienced and continue to be used to proactively manage Reliability efforts and results. The process of initial education, assessment, master planning, process design, and implementation supported by Subject Matter Experts has provided U.S. Sugar with the right tools for long-term sustainment and continuous improvement of all aspects of the company operation.